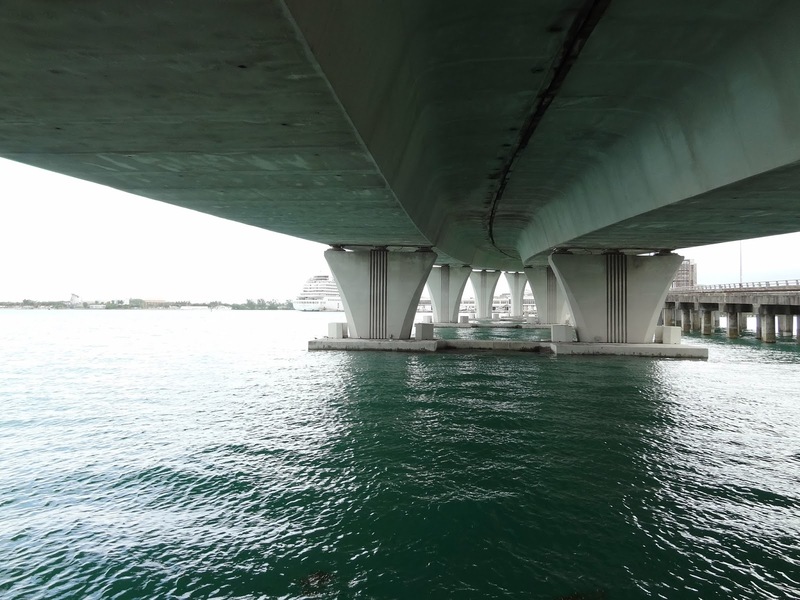 Just south of MacArthur Causeway is the curvaceous Port Causeway and its neighboring railway and highway bridges connecting Miami to the Port of Miami. The Port Blvd Bridges (FDOT #875000 and 875001) are parallel cast-in-place prestressed concrete box girder bridges that were built in 1991. The superstructures are supported on flared single column bents with bearings. A longitudinal joint is between the two bridges. The bridges are 16 span 2521 ft long bridges that slowly rise and fall to provide a shipping channel next to the movable spans on the adjacent bridges. The Rickenbacker Causeway is about a mile to the south but I didn't get a chance to photograph it. That bridge, the bridges across south Biscayne Bay, and all the bridges connecting the Florida Keys will have to wait for another trip to Florida. Miami-Dade County, Florida Bridges: Port Causeway Bridges by Mark Yashinsky is licensed under a Creative Commons Attribution-NonCommercial-NoDerivatives 4.0 International License.